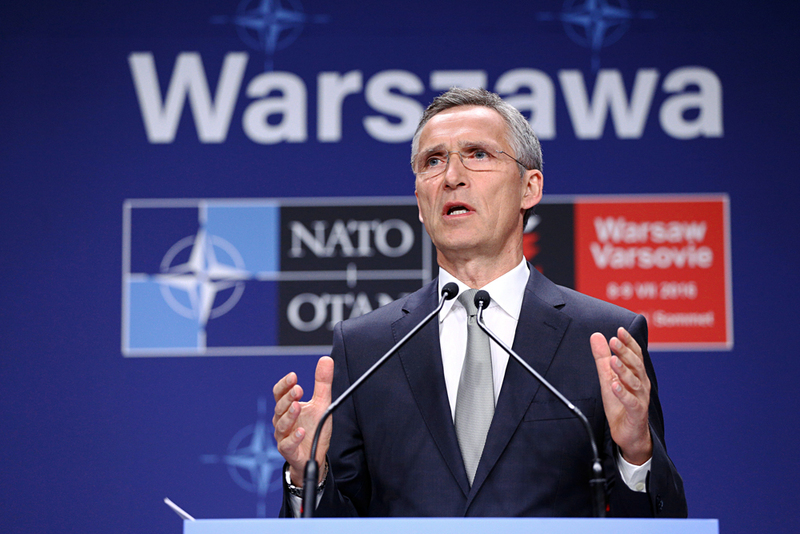 NATO Secretary General Jens Stoltenberg speaks at a news conference during the NATO Summit in Warsaw, Poland, July 9, 2016. Russian military experts have summed up NATO’s actions as “they want peace but prepare for war,” adding, however, that Moscow will not be taking retaliatory measures against the alliance following its latest summit in Warsaw. The North Atlantic Alliance is to deploy four additional divisions in Poland and the Baltic states, with a total of 4,000 service personnel to be deployed on a rotational basis as part of the scheme. While Moscow has expressed its displeasure at the decision, which was formally announced at the bloc’s summit in Warsaw on July 8-9, the move is not technically in breach of the 1997 Russia-NATO Founding Act. Under that agreement between the parties, NATO undertook not to deploy “large military contingents” close to Russian territory. The alliance member states also announced that the European element of the U.S. missile defense plan has entered the basic level of combat readiness. That means that the U.S. naval forces on the Rota base in Spain, radar systems in Turkey and interceptor missiles in Romania have begun joint operation to counter potential threats to the alliance. Meanwhile, U.S. warships will continue to enter the Black Sea, which is expected to provoke a negative reaction from Moscow. The two sides are due to have an official meeting soon: A session of the Russia-NATO Council will convene on July 13. The NATO leadership has already declared the intention to adopt a number of “trust-building measures.” These include the activation of transponders (the friend or foe identification systems) aboard NATO and Russian warplanes as well as signing an agreement for the prevention of incidents in the air and at sea. If these agreements are reached, one could say that some of the tensions in Russia-NATO relations have been removed. So far, however, these relations are far from calm. Ahead of the NATO summit, writing in a Financial Times column, U.S. President Barack Obama put the threat to Europe’s territorial security from Russia on a par with the threat posed by Islamic State militants. According to Vladimir Yevseyev, a military expert and deputy head of the CIS Institute, since the start of the Ukraine crisis, NATO has acquired a purpose in the minds of the citizens of its member states that was lost with the breakup of the Soviet Union, that of the need to oppose Moscow. “Politically, the non-existent ‘Russian threat’ and the real challenges from Islamic State militants will help the alliance to unite in the face of Brexit and similar centrifugal forces in Europe,” he said. In his opinion, the outcomes of the summit are moderately negative for Moscow: They could have been far tougher but they could not have been any softer. “It is a compromise in a way. Formally, readiness to cooperate is declared, though what is being pursued for real is not so much a policy of containment as a policy of intimidation towards Russia. They want peace but they are preparing for war,” said Yevseyev. Military expert Viktor Murakhovsky, editor-in-chief of the Arsenal Otechestva (Arsenal of the Fatherland) magazine, said that Russia would not be taking any additional steps in response to NATO’s actions and political statements. “The Defense Ministry is guided by the real military potential of our NATO partners rather than by statements from their leaders or politicians,” he said, pointing out that the Kremlin is continuing to implement plans for the development of the Russian armed forces through 2025. “As part of this plan, new units are being deployed in the Western Military District and a large-scale rearmament of the troops with the newest weapons and equipment is under way,” said Murakhovsky. As part of the countermeasures already being implemented, in January 2016 Russian Defense Minister Sergei Shoigu announced the formation of three new divisions (peacetime divisions, of under 13,000 servicemen) in the west of the country to counter the alliance’s decisions, which have now been officially adopted at the summit in Warsaw. In the meantime, the United States and NATO may already be eyeing Asia, Yevseyev warns. “The U.S. administration realizes that in order to preserve politico-military supremacy on the world stage it is necessary not only to bolster its levers of influence in Europe but also to transfer them to Asia to contain the emerging threat from China,” he explained. Yevseyev went on to add that Washington had already started building 12 destroyers equipped with guided missiles in order to strengthen its naval grouping in the Asia-Pacific region. “Under the cover of deteriorating relations with Russia, the U.S. will gradually be moving into the Asia-Pacific region. This trend will become even stronger with the arrival of a new president, irrespective of who wins the election, Trump or Clinton,” said Yevseyev.